New Super Low Sale Price! This MCS Clear 3-1/2 x 3-1/2 Interlocking Acrylic Photo Cube can display up to 6 photos. 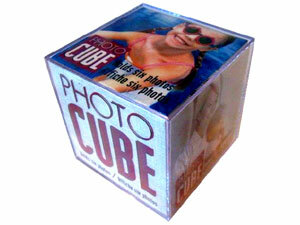 Easy to use; just slide the cube open, adhere your photos onto the cardboard cube insert, and slide the cube closed. Buy a few photo cubes and create your own multi-sided stackable photo collage. Holds photos 3-1/4" x 3-1/4"
Note: Photo above shows how to open and close the photo cube.